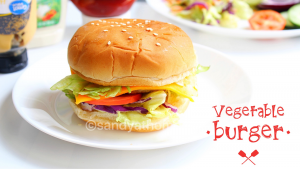 Veggie burger/ Vegetable burger is a wholesome and delicious sandwich consisting of burger bun/ bread, vegetable patty and loaded with fresh veggies and cheese. For me burgers are always a filling and healthy option that can be consumed any time of the day. 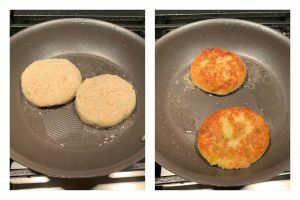 Though it takes little time to cook the patty other things are just chopping veggies and assembling which is easy to do. This recipe us all about a simple and very basic veggie burger recipe prepared completely in home style which tastes good and fresh. 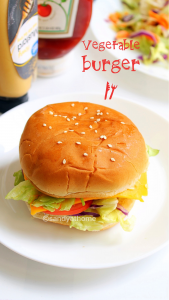 Homemade burgers are more healthy (of course the restaurant ones are tasty) as the patties are made fresh and is tawa fried which is not too oily and can be consumed by anyone. 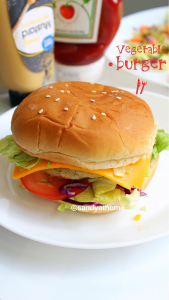 For this recipe I used those veggies like lettuce, purple cabbage, tomatoes, onion and cucumber that I usually like the burger to hold and it can be replaced with other veggies if your choice. 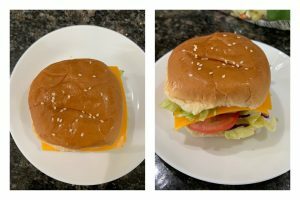 I have used cheddar cheese sheets for my burger for that restaurant style look , which can be skipped or replaced with any cheese of your choice. So anytime you get bored of eating burgers at restaurant try making burgers at home withe any patty of your choice. So lets get to the making!! In a pressure cooker add all the chopped veggies, salt and water. Pressure cook for 4 whistles. 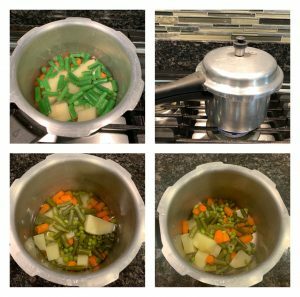 When the pressure is released open the lid, drain the water and mash the veggies well. Keep the mixture aside. 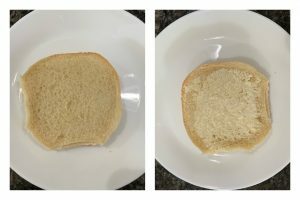 Take bread slices and make it into small pieces. 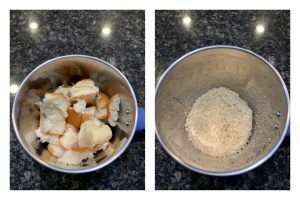 In a blender add the bread pieces and blend it into crumbs. Transfer the bread crumbs to a plate as it will be easy to coat the cutlets. In a small bowl add maida and water. 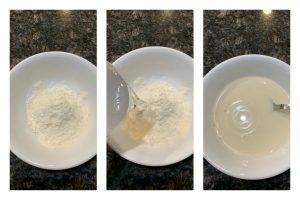 Mix well to form a thick paste. This mixture will be used for dipping cutlets before coating with bread crumbs. Heat 1 tsp oil in a pan, add chopped green chilli, onion and ginger garlic paste. Saute well and keep it aside. 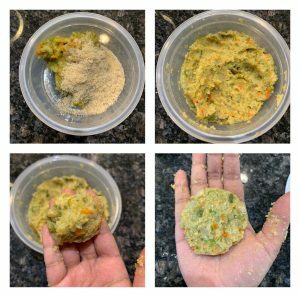 Now in a bowl add mashed veggies ground bread crumbs, red chilli powder, garam masala powder, cumin powder, sauteed onion mixture and salt if required. Mix well until well combined. 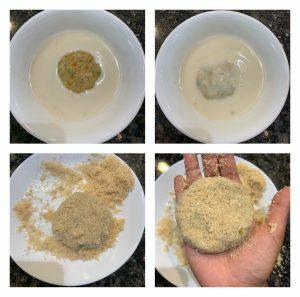 Now gently take one shaped cutlet mixture, coat it well in the maida batter and then immediately transfer the maida coated cutlet on to the bread crumbs. Coat the batter coated cutlets well in bread crumbs. When coated well keep it aside. Repeat the whole process till all the cutlet mixture is coated. Heat oil in a tawa and place the bread crumbs coated cutlets one by one and pan fry them in medium flame till both sides turn golden brown. When done transfer it to a plate with paper towel. Now lets prepare the burgers. Cut burgers buns horizontally . 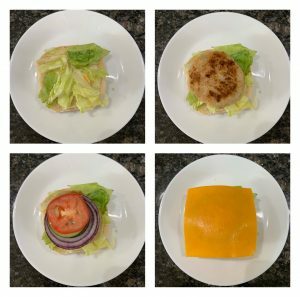 Apply the base burger bun with mayonnaise, place some lettuce, over it the patty that we prepared, over it the tomato slices, cumber slices, onion slices and finally the cheese slice. Now finally place the burger bun top part too. Serve it with tomato ketchup or any sauce of your choice!! 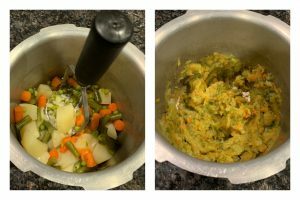 In a pressure cooker add all the chopped veggies, salt and water. Pressure cook for 4 whistles. When the pressure is released open the lid, drain the water. 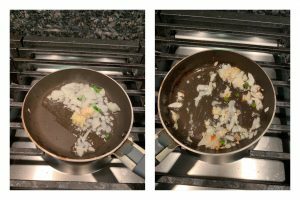 When the veggies are hot enough and mash the veggies well using a masher. Keep the mixture aside. Now gently take one shaped cutlet mixture, coat it well in the maida batter and then immediately transfer the maida coated patty on to the bread crumbs. Coat the batter coated cutlets well in bread crumbs. When coated well keep it aside. Repeat the whole process till all the cutlet mixture is coated. Heat oil in a tawa and place the bread crumbs coated patties one by one and pan fry them in medium flame till both sides turn golden brown. When done transfer it to a plate with paper towel and serve it hot with ketchup. Now place some lettuce, over it the patty that we prepared, over it the onion slices, cucumber slices, tomato slices and finally the cheese slice. Now finally place the burger bun top part too. Serve it immediately with tomato ketchup or any sauce of your choice as the burger might get little soggy.